This wine tour will take you to the best wineries in Sonoma and Napa County. Our years of experience in quality wine touring has allowed us to share the best kept secrets in value for those visiting the wine capital of California. Rest assured that you will experience a premium 16 hour, multiple day wine tour experience at an incredible value and service for your group. 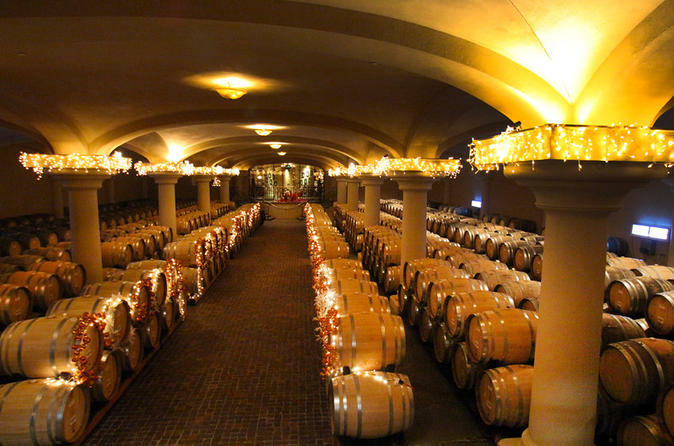 Guests have the option of adding and customizing the list of wineries to visit as well. Free wine tasting(s) (Please contact tour provider via email or phone call after booking reservation to learn more!) This list is provided separately ONLY after booking. Our wine tour guide will arrive in a black on black luxury sedan or SUV at a predetermined location to pick up guests up to 7 people. We provide the option of guests enjoying a bottle(s) of wine on us, at the beginning of the tour. Otherwise the bottle(s) of wine we provide for the tour will be saved as a gift at the end of the tour. If you are unsure of which wineries to visit, there are predetermined lists of our top picks available, and we can accommodate your specific desired wine type (Our wine concierge will be in touch with your group upon booking to help you walk through the best winery destinations for your group's preferences in wine, venue type and price ranges for tastings). You may also provide us with their own list of preferred wineries to visit on the 8 hour tour although there may be additional tasting fees. Immediately from the pick up location we will begin our journey into Sonoma and Napa and stop at up to 5 wineries each day to enjoy tastings, foods, scenery and ambiance. At each winery, your chauffeur will drop guests off at the front door/entrance for as long as desired by the guest party. Once called upon via text or phone call, the chauffeur will pick up guests where they were dropped off, and move on to the next winery destination. At any point during the trip, guests may ask to stop for lunch or dinner, so long as it is done within the 8 hour time frame (including the pick up and drop off time duration). Guests will be safely transported either back to the original pick up location, or another location specified by the guest group. The guest group will also receive up to 2 bottles of red or white wine, as a gift!